This entry was posted in Thoughts and tagged Army, Help, Life, Rescue, Soldiers. So true… Infact, they always save. But mostly from terrorists & attackers. Things will not change unless whole of the mankind starts respecting each other & start believing that everyone’s life is precious. About Uttrakhand, its really a frightening situation there. May GOD bless the victims. Totally agree with you. In my experience, the majority of people are against violence and wars. Unfortunately, the minority (e.g. terrorists and warlords) or some governments continue fueling violence on this planet. Yes, its pathetic situation in Uttrakhand & we feel so helpless. Even those who are rescued are so shocked by the frightening picture they saw that they can’t even sleep & eat. All we can do is pray for them. May GOD bless them. I wish to see that day as well. Will be a wonderful thing when it happens O. 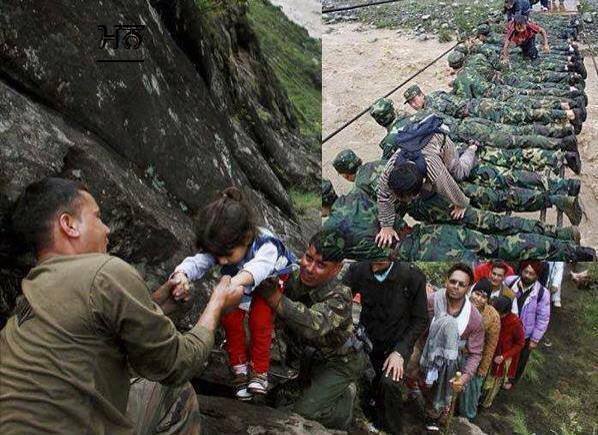 Proud of the courageous Indian army soldiers who are rescuing thousands of pilgrims. I like the way they made a human bridge – very creative solution in desperate circumstances. You can be proud of your courageous soldiers. I am inspired by this picture and can’t resist adding it to my recent post on the Himalayan Floods. I do hope I have your blessings to spread such inspiring deeds. Of course. Feel free to spread anything from my blog. That’s the essence of the blogosphere – sharing love, sharing good thoughts. I love this. A very moving picture. The army personnel are the ones who are actually helping people cope with the disaster, while our politicians are just chilling. Glad that you liked this picture. Very moving. That’s quite an inspiring photo – a human bridge! After doing this good work of directly saving people, I wonder how the soldiers feel about their other work. Hopefully, they will never need to do that ‘other work’.